The Janka Hardness Scale can tell us a lot about how much wear and tear a given wood species can withstand. One of the things you’ll become familiar with as you look into new hardwood floors is the Janka Hardness Scale. This is a scale designed to help us measure how durable a given hardwood species is to wear and tear. 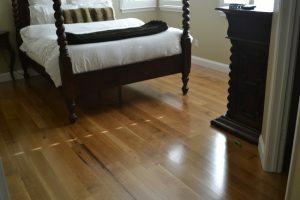 What is it exactly, and how should you use it to choose the right hardwood for your flooring needs? Here’s a basic primer on the Janka Hardness Scale. The Janka Hardness Scale was conceived by an Austrian researcher named Gabriel Janka in 1906 as a way to measure the relative hardness of different wood species. The Janka number of a given wood species is the average amount of force that is necessary to embed a .444 inch steel ball half its diameter into a piece of wood. While that sounds a little confusing and, frankly, not at all helpful at first glance, we can use this number to determine how well a given wood species can stand up to wear and tear. This can have consequences, especially when it comes to hardwood flooring. The Janka Hardness Scale rates wood on a scale between 0 and 4000, with 0 being the softest and 4000 being the hardest types of wood. For comparative purposes, one of the softest wood species on the market is Eastern White Pine, clocking in a 380 on the Janka Scale. On the other end, one of the hardest wood species, Redland Rosewood, measures at 3840 on the scale. Wood species can appear at any point in this spectrum, so how can we make use of it in planning out your new hardwood floor? Is there a lot of traffic in this area of the house? Kitchens and living rooms may require a harder wood species than little-used areas of the home. Do you have pets or children? They can wreak havoc on your floors, so a stronger species might save you maintenance and repair time and costs. By utilizing the Janka Hardness Scale, you can make the hard choices easier and come up with a beautiful new wood floor that fits your unique needs! This entry was posted on Thursday, June 1st, 2017 at 4:23 pm. Both comments and pings are currently closed.